Recognizing that inequality cannot be addressed without addressing the role debt has on working people, Jobs With Justice launched the Debt-Free Future Campaign in the fall of 2012. The campaign challenges the growing student debt crisis and its economic impact on recent college graduates, working individuals and families across the country. Student debt is increasing at a record pace at a time when wages have remained stagnant and unemployment remains stubbornly high. It is also the most difficult type of debt for individuals to escape under current laws and regulations. 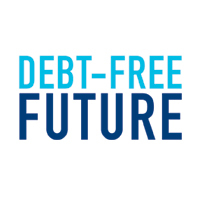 Debt-Free Future aims to address the debt-based economy by eliminating the burden of student debt by increasing access to existing debt-relief and flexible repayment options. Our work includes supporting tens of thousands of people enrolling into these debt-relief programs, advocating for their expansion, hosting trainings about debt-relief options and pushing the Department of Education to promote these alternatives.